Something that occurs to me, browsing City sets on Brickset: should we be listing Great Vehicles as a subtheme of City? It's one of the main categories LEGO uses to define their City lineup since at least 2012 (even on their products page), but currently the database sorts them into various subthemes according to their subject matter like "Traffic", "Medical", "Harbour", "Construction", etc. Also, I notice that LEGO has a lot of more specific names for their City subthemes on their website than Brickset uses. The 2017 sets we have listed as "Jungle" are listed on LEGO.com as "Jungle Explorers", the 2017 sets we have listed as "Fire" are listed as "Fire Brigade" (though they were listed as just "Fire" when they came out so that one might not need to change), and the 2018 Mining sets we have listed as "Mining" are listed as "Mining Experts". Looking at past versions of the LEGO City website on Archive.org, the 2015 sets we have listed as "Construction" were listed as "Demolition", and the 2016 sets we have listed as Prison Island were listed as "Prison Island Police". It may seem a little odd to break up existing subthemes like Mining or Construction into separate groups by their year of release, but ultimately I don't feel it's that different from how we already break Police into Swamp Police, Forest Police, etc. Or for that matter, how we break Space Police into Space Police I, II, and III. Finally, City has since at least 2013 had a "Town" subtheme… but like Great Vehicles, Brickset doesn't seem to acknowledge it. Some Town sets over the years have included #60023, #60026, #60086, #60097, #60132, #60134, #60153, #60154, and #60169. I understand that it can be useful to sort sets according to what kind of jobs or groups they're associated with, but couldn't this be better achieved using tags than by ignoring the official subthemes? Some of those like great vehicles would be nice but adding town as a Subtheme for City would be confusing considering the entire line used to be called Town. And yeah, as confusing as it might sound to some, I think the City - Town theme should be listed as such. I'm pretty sure it is not the only occurence of such a phenomenon. Pirates (the big main theme) for example has multiple sub-themes that are also called Pirates (Pirates I (1989-1997), Pirates II (2009) and Pirates III (2015) respectively. Also Aquaraiders is both considered a Main Theme (2007 line) and an Aquazone sub-theme (1997 line). Semi-related to this topic: I was thinking about a Town subtheme I remembered but couldn't find in the database and I got curious, so I flipped back through some catalogs. It turns out there are a few subthemes named in catalogs that aren't listed as Town subthemes in the Brickset database! The 1991 US catalog lists #6508, #6510, #6644, #6646, and #6669 in the "Max RPM" subtheme. Its logo is a checkered flag shown flat. In the 1992 catalog, 1993 catalog, and 1994 catalog, this subtheme is renamed "Race" and #6514, #6537, #6538, #6539, #6551, #6561, #6648, #6663, and #6670 are added. The "Race" logo is updated to show a wavier checkered flag on a light blue field. 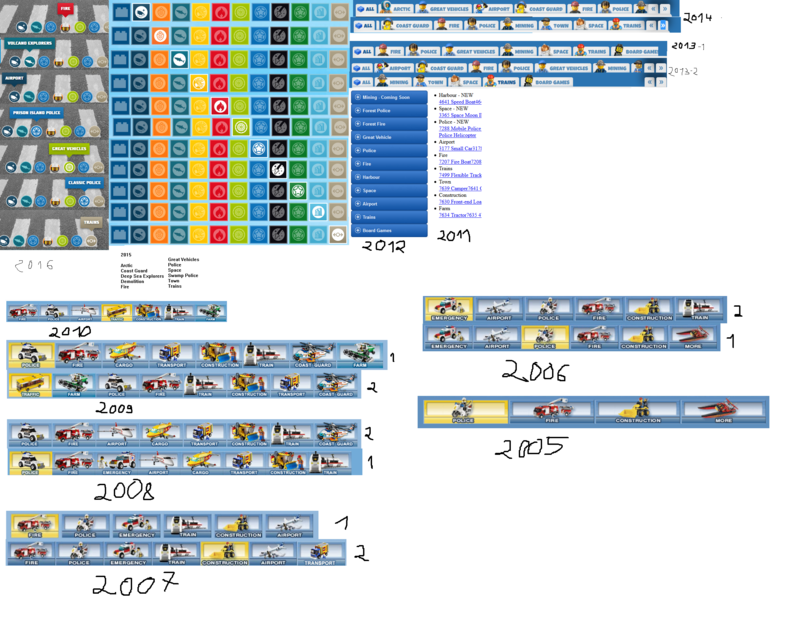 Currently all of these sets are variously listed in the "Vehicles", "Racing", and "Boats" subthemes of Town (which do not appear in these catalogs at all), while Brickset's own "Race" subtheme (separate from "Racing", strangely) only includes sets from 2000. In the 1990 catalog, this subtheme went by an even different name, "High-Speed Adventure"
These catalogs also list #6542, #6540, #6541, #6679, and #6353 in the "Nautica" subtheme. This subtheme's logo is a yellow anchor on a blue field. It's the subtheme I was looking up originally, which I remembered seeing as a kid in posters and catalogs. Currently, they are listed on Brickset as Boats, Police, and Coast Guard respectively. While these accurately describe what categories of vehicles they include, now that Brickset has tagging we can use tags to reflect that without formally assigning them to those subthemes, same as how I think we should for the City Great Vehicles. Finally those catalogs list #6340, #6344, #6348, #6354, #6364, #6380, #6387, #6389, #6398, #6483, #6511, #6531, #6571, #6593, #6664, and #1896 in the "RSQ 911" subtheme (renamed "Rescue" in 1993, which is probably the name it was already using in other countries since 911 is a US-specific emergency number). Its logo is a white fire helmet on a red field above a yellow police badge on a blue field. Again, if Brickset were to use the Rescue label as the name of the subtheme, they could be separated into fire, police, etc. via tagging. In the 1990 catalog, this subtheme went by the name "Emergency". While I'm mentioning things, the 1990 US catalog referred to the Flight subtheme as "Airport", but it was "Flight" from 1991 onward and Brickset currently uses this name. In the 1995 catalog and 1996 catalog, the "Race" subtheme adds #6334, #6335, 6337, #6484 (currently listed on Brickset as one of two "Rescue" sets, strangely), #6517, #6546, #6596, and #6639. In the 1990 catalog, the "Flight" subtheme (which is, as far as I can tell, fairly accurately cataloged on Brickset) was known as "Airport". It was "Flight" from 1991 onward. In the 1990 catalog, the "RSQ 911/Rescue" subtheme was known as "Emergency" and included 6380 (already mentioned in the previous post) and #6482 (the other set already in the "Rescue" subtheme on Brickset). In the 1995 and 1996 catalogs, the "Rescue" subtheme adds #6338, #6525, #6545, #6625, and #6598. Perhaps this sort of thing would justify the introduction of sub-sub-themes? Perhaps we need to think 'relational' instead of 'hierarchical'.